MOSCOW, November 30. /TASS/. More than 30 civilians have been killed in a US-led coalition airstrike on the Al-Shafaa settlement in Syria’s Deir ez-Zor province on Friday, the Syrian Arab News Agency (SANA) reported, citing its sources. According to SANA, most victims are women and children. Earlier in November, the coalition several times carried out airstrikes on Al-Shafaa and the nearby town of Hajin. The November 21 attack involved white phosphorus shells. On November 12 and 14, Al-Shafaa and Hajin were targeted with cluster bombs. At least 60 people were either killed or suffered wounds in the three airstrikes. According to the Syrian Observatory for Human Rights, US-led coalition airstrikes have killed more than 40 children in the Deir ez-Zor province since the beginning of November. Earlier in the month, the Syrian Foreign Minister sent a letter to the United Nations Security Council, accusing the US-led coalition of war crimes and disregard for human life. 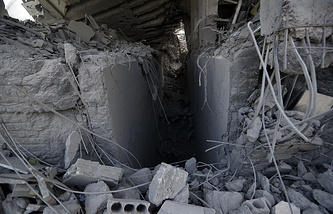 Damascus called on the UN Security Council to strongly condemn the coalition’s activities and establish an independent and neutral mechanism to investigate into war crimes and punish those responsible.